In our inaugural piece, we share Destiny’s story. 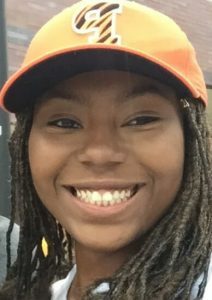 She is a member of Princeton University’s Class of 2020 and is pursuing a degree in English. On the surface, Destiny’s profile is similar to that of many other successful college applicants. She went to a private high school. She had a stellar GPA and good test scores. She loves creative writing and received many accolades. Dig deeper and the similarities fade. Destiny’s parents “clawed tooth and nail” to escape the inner city projects of Newark, NJ and were able to achieve success. In addition to the pressure of constantly being reminded “we could not go backwards”, Destiny also faced the challenges of moving often, constant bullying, microaggressions, and extreme shyness. Please read below to learn more about Destiny and the personal qualities, values, and support system that have allowed her to succeed. We recommend reading from beginning to end but feel free to skip around. Our favorite section is the “What Makes You You” section. 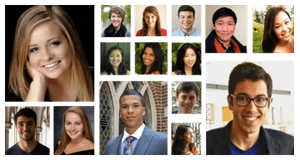 In our “How I got Into” series, we share the stories of successful applicants to Princeton and other great colleges. Our profiles go beyond a simple list of academic and extracurricular achievements. We also delve into the “how” and the qualities that successful applicants exhibit. We provide a rare look into what drives these students, how they’ve overcome their challenges, how they’ve been shaped by significant events in their lives, how they deal with the pressure to succeed, and much more. Whether you are considering selective colleges or not, it is our unwavering belief that our values and personal qualities (and luck) are the major contributors to success. How would you characterize your parent’s parenting style? Did your parents have specific philosophies regarding any of the areas above? They always taught me “Family first”. They wanted us to be successful and continue their legacy, and figured the best way to do that was to push us. They didn’t think friends should be any sort of priority in our lives. I wanted to make money, and my dad would only let me work if I did it for his company. What were your major passions/ interests in high school? Writing, Advocating for minority issues. How much time did you spend on these things? When did these passions/interests first come about? At a very young age; I’ve been into creative writing since I was 6 years old, inspired by reading C.S. Lewis’ The Lion, the Witch, and the Wardrobe. In elementary and middle school, I would usually finish tests and assignments early; when I did, my teachers would tell me to read a book. This turned me into a ravenous reader as well. How were these passions/interests developed over time? My mother is an author so she definitely encouraged me in my literary pursuits throughout my childhood. I wrote a lot of short stories in my free time. When I was in high school I got into poetry by taking creative writing classes. It’s something I’m still pursuing today at Princeton. What level of achievement did you reach? Tell us a little bit about how you achieved these achievements? My English teacher and my parents. What kind of sacrifices/challenges did you overcome to achieve these extracurricular results? I struggled with not being the best writer in my creative writing class. I had to accept that some people are better than me and that I had lots of room for improvement. What were your major service-related activities? I volunteered at my church as a Sunday School teacher; I was also involved in a number of community outreach activities through my church; I led a Relay for Life team for 3 years. What did you do in the summers during high school? In the summer after 9th grade, I just hung out with my friend and chilled around the house. I was also working on revising one of the early drafts of a manuscript for a fantasy novel I was working on. I didn’t feel the need to have a job yet and even if I got one I had no means of getting there, so I didn’t see the point. The summers after 10th, 11th, and 12th grade I worked at my father’s insurance company. My father wasn’t the type to give us an allowance or lots of spending money. He was very much the “if-you-want-it-you-buy-it” type. Yet when I said that I wanted to get a job, he told me that if I was going to work, I was going to work for him. I was mostly doing whatever anyone else around the office didn’t want to do: filling out reports, filing duty, contacting different clients, updating contracts and licenses, etc. Do you know which test to take? Check out our recommendations here – Should I Take the SAT or the ACT? Which SAT Subject tests did you take? Which AP/IBs did you take? What were your major academic achievements in high school? What do you attribute your academic success to? Hard work, discipline, and being very intentional with my time. I wasn’t the type not to do something because I was “too lazy” or “didn’t feel like it”. However, I also made sure to follow and develop my passions. If I postponed doing work because an idea for a story popped into my head, I’d write the story, and I didn’t consider it to be a waste of time. I treated my passions with almost the same respect I did my schoolwork, which allowed me to go far. My parents and friends were very supportive. Some teachers, as well. I had one English teacher, Mr. Lutz, for all 4 years of high school. He ran the school literary magazine and taught creative writing classes, all of which I was involved in. His mentorship made me a dramatically better writer. Did you ever receive private tutoring? Once, in Algebra II. I had an abysmal teacher and wasn’t able to learn the material on my own. What kind of sacrifices/challenges did you overcome to achieve these academic results? I worked very hard. I have never been the type of person who doesn’t study and still do well on a test. Everything I do, including things I consider myself somewhat naturally talented at (such as writing), I’ve studied, and worked hard at improving. I sacrificed a lot of leisure time to pursue my studies. In addition, in the latter half of my high school career, there were some health issues in my family which led to hospitalizations, which added to the stress I was already under. However, I’m proud of myself for persevering. Any specific approaches/tips & tricks to studying that were particularly helpful for you? For me, what helped was keeping a schedule. Like: “I’m going to spend 7-8 doing Spanish hw, then 8-11 writing this paper, then 11-1 doing my lab report”. Even if you don’t write it down and just keep it in your head, it’s very useful. Also, try to enjoy or be interested in what you’re learning, just doing mental tricks like that can help a lot. If you’re getting bogged down with work, give yourself incentives. Watch an episode of your favorite tv show after X hours of work, tell yourself that you can get ice cream only after you finish your essay, etc. Did you declare a major? Did this end up being your actual major? Yes and yes. Which schools did you apply to (that you remember)? Which schools did you get into? All except for Davidson, where I was waitlisted. Who did you ask for letters of recommendation? An English teacher that I had had for all 4 years, and my advisor (everyone in my school was put into an “advisory group” led by a teacher). Why did you ask these specific people? I had great relationships with both of them, and asked them both for advice all throughout high school, so they were natural choices. Plus, my advisor had graduated from Princeton. What did you write about in your common app essay? I wrote about my process of beginning the manuscript for my fantasy novel at age 11. 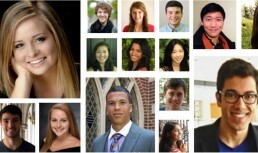 Why did you choose Princeton? 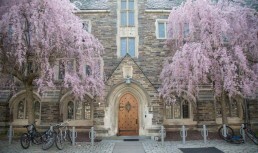 I chose Princeton because they have one of the best creative writing programs in the country, with amazing professors who are well-known in the literary world. I also liked the size and beauty of the campus, and the fact that professors supposedly took an interest in their students. What was a typical weekday like in junior year of high school? I had 5-6 classes every day. Class ranged from 45 min to 70 min. Every day we had a 45 minute period called “meeting period”; various clubs would meet at this time and if I didn’t have a meeting, I would hang out with my friends around the locker area, go to the campus store to get a snack. Lunch was at 12:15. I had a pretty tight friend group. We would claim one of the round tables in the cafeteria for our own. We were always the weirdos laughing loudly in the corner. After that, more classes. After school ended at 3 I got picked up and headed home. I spent about an hour or two lounging around the house and relaxing, and then the rest of the night was usually taken up with homework (minus dinner and showering). My school assigned a ridiculous amount, and I’d regularly be up until 2-3am working. On average, how many hours of HW and studying did you do every night? Easily 6 hours a night. What time did you usually go to sleep? Somewhere between 1 and 3 am. What was a typical weekend like in high school? I would go to the movies or the mall with my friends on Saturdays. Sundays I woke up at 6 to go to church in South Plainfield, where my father was the senior pastor. We had 2 services, and I was usually teaching children’s Sunday school for at least one of them. Afterward I’d socialize while waiting for my dad to get out of meetings. Then we’d get home, eat dinner as a family and watch the football game. I usually didn’t start my homework for Monday until Sunday night. What drove you to succeed in high school? Where did this drive come from? My parents raised me to have a strong work ethic. I was told from the time I was little that I had to be successful. My family was well-off and I grew up in the suburbs, but my parents, aunts, uncles, older cousins, were all from the projects of Newark, NJ. They clawed their way tooth and nail to get out of the inner city. So I was always told that we could not go backward. That whatever success my parents had, I had to take it to the next level. I was also bullied severely growing up, from preschool until 8th grade. People telling me that I was worthless only drove me to study more, to work harder, to prove them wrong. It turned me into a pretty disciplined and competitive person. What kind of expectations did your parents have for you? Going to college wasn’t an option. I would go to college, and though it was never explicitly stated, I was expected to go to an elite one. 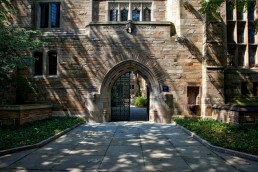 I had always had a dream of going to the Ivy League, and my parents definitely wanted me to apply. I’ve also been told I need to eventually get a Ph.D in something. What kind of pressure did you feel to succeed? Where did this pressure come from? A lot of pressure. Half of it self-imposed, half of it put on by my family. I was a good kid, and had been making straight A’s since I was 4 years old, at a certain point everyone expects you to be super successful. I felt like if I failed I would not only let myself down, but my family and my church as well. In addition to pressure from my parents, my high school was very competitive, which fed into this mentality. My grade especially was a bit cut-throat. Also, due to my race, people often had low expectations concerning my intellect. So of course, I had to prove otherwise. How did you deal with this pressure? Honestly for the vast majority of my high school career, I drove myself harder than I should have, which led to me being extremely stressed. I tried to be intentional about making time for myself on the weekends, prioritizing leisure over school work. How did you balance everything going on in high school? What helped me was staying focused. I liked to make schedules and to-do lists, to keep my life organized. Any strategies, tips, tools, types of support that helped you? My friends, both inside and outside of school, were a huge help. They were constantly encouraging me, had an unshakeable faith in my abilities, and were hilarious. To this day, I have never laughed more than when I was with my high school friends. Any major events growing up that helped shape your high school self? I moved a lot growing up. I lived in 3 states, moved 7 times, and went to 7 different schools. I didn’t have a lot of friends due to constant bullying, and when I did make them, I moved and we lost contact. This pattern caused me to be extremely shy until the summer after 10th grade. I attended this summer leadership program that was all about making people get out of their comfort zone. It really helped me get over my fears and resulted in me becoming more outgoing in general. Any other struggles/challenges (that we didn’t discuss so far) that you faced in high school? While growing up? In my school I felt like I had to constantly prove how smart I was. My senior year, during college application season, whenever two or more people were applying to the same school, most other people would take bets on which one would get in. Several other people besides me were applying to places like Harvard and Princeton. No one (except my friends) betted on me. How many languages are you proficient in? 1. English. How has your culture or identity influenced you during your middle school or high school years? I was one of the few black people at a high school consisting mostly of wealthy, white people. I experienced a lot of microaggressions and a lack of empathy from the administration on minority issues. I was very proud of my culture, and made that apparent, which often made my peers uncomfortable. What values were most important to you in high school? What was your #1 core value? How did you demonstrate those values in high school? Through my passions and my school work. What do you consider your most important personal qualities? I am empathetic, a visionary, I’m a natural-born leader, motivated, driven. How would you characterize your personality growing up? I was painfully shy up until around 11th grade. I didn’t make eye contact, rarely introduced myself to people, didn’t talk much outside the house. I was quiet, studious and a tad bit mischievous. Was there anything special or different about your family when you were growing up that helped shape who you were in high school? My family is very religious; my father is a pastor, and comes from a long line pastors. That type of upbringing definitely contributed to me staying focused. I wasn’t distracted by things like parties because I wasn’t allowed to go to them lol. I am a very practical person, and am almost utilitarian with my time. I like to be busy, and I like my time to be spent with a purpose, even if that purpose is relaxing/hanging with friends. I’m a deep thinker, and spend a lot of time pondering philosophical questions and being an amateur social psychologist. I have a seemingly infinite imagination and am constantly being inspired by the most mundane things about me. I am also a very direct and blunt person, which doesn’t appear to be all that common. Did you have any major influences growing up? If so, who/what were your they? The fantasy genre as a whole, especially work by authors C.S Lewis and Tolkien. ~90% of the books I read in my free time were fantasy, and I hope to one day become a fantasy author. Gospel music and what I would call “black church culture” was a huge influence as well. Having a pretty tight-knit family meant my parents had the biggest impact on my life. If you had a question or needed some advice, who would you go to? My mom, usually. Sometimes my dad, or my English teacher. Most important lessons that you learned or were taught while growing up? Never let anyone tear you down or tell you what you aren’t. Having healthy self-esteem and self-worth is one the most valuable things you can possess. You are absolutely incredible. Don’t let anyone tell you otherwise. Always aim for excellence, no matter what you do. My mom used to say even if I became a garbage man, I should be the best darn garbage man in the history of sanitation. No one is perfect. Especially not you. You’re going to make mistakes. Admit your faults and failures, but don’t wallow in them, or let them hold you back. You can only learn what not to do by failing. Any advice you would give to your high school self? Calm down and don’t stress out so much. Also, focus your extracurriculars on the things you want to do, not the things you feel like you have to do. Pick one or two things you want to pursue, and pursue them to the highest level possible. Check out our next profile and read about Maia’s story. You can also check out a summary of all our other stories here – How I Got Into Series. Like what you read? Subscribe to our mailing list, and we’ll let you know when we release similar articles and other in-depth guides. Please also share using the buttons on the side. At PrepMaven, our mission is not only to help your child increase their test scores and get into a great college but also to put them on the right track for long-term personal and professional success. 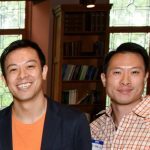 Greg and Kevin are brothers and the co-founders of PrepMaven and Princeton Tutoring. They are Princeton engineering graduates with over 20 years of education experience. They apply their data and research-backed problem solving skills to the test prep and college preparation process. Their unique approach places a heavy emphasis on personal development, character, and service as key components of college admissions success. In this regularly updated post, we share the admissions essays that helped students get into their dream schools. Do you know what happens after you hit that "Submit" button? Learn about the admissions reading process at selective colleges. GET NOTIFIED OF NEW RESOURCES OR GUIDES!